Bangkok, Thailand -- Worship is generally not a life-threatening pursuit. But devotees across Asia could be taking their life into their hands every time they go to a temple to pray, according to a study by a Thai doctor. Burning joss sticks lit as an offering in shrines and temples fill the air with cancer-causing toxins that are every bit as deadly as traffic fumes and cigarette smoke, says Dr Manoon Leechawengwong. Dr Manoon, who has just completed a two-year study of temple workers tasked with clearing the smouldering sticks, found the cocktail of chemicals in the smoke put them at risk of leukaemia, lung, blood and bladder cancers. "One joss stick creates the same amount of cancer-causing chemicals at one cigarette," said Dr Manoon, who led the research. "I knew there would be some carcinogens, but I was surprised by the levels." 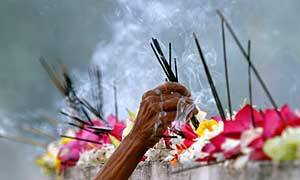 Joss sticks are a type of incense used in worship in many Asian countries. In Buddhism they are believed to aid spiritual communication and serve as an offering. Dr Manoon's study was conducted among 40 workers in three temples at Ayutthaya, Chachoengsao and Samut Prakan, sites chosen deliberately far from Bangkok's traffic pollution. The findings were compared with another 25 people living in a joss-stick free environment. Temple workers were exposed to high levels of benzene, also known as petroleum ether, related to leukaemia; butadiene involved in blood cancer; and benzo[a]pyrene that can cause lung, bladder and skin cancers. The level of benzene in the temple workers was four times higher than normal, butadiene was 260 times higher, and benzo[a]pyrene - the most dangerous carcinogen - 63 times greater. Analysis of the temple workers blood and urine samples discovered damage to their DNA, with a correspondingly lower capacity of their bodies to repair that damage. "We know from our study that there's DNA damage," said Dr Manoon. "But what we don't know is if they will develop cancer. Certainly they have a greater risk. It's like smoking. Not all smokers get cancer, it's about 20% ." But Dr Manoon urges worshippers to reduce the risks by extinguishing the scented joss stick immediately after use, rather than leaving it standing pots of sand as it burns down. Manufacturers could also produce sticks that burn for a minute or less. "It's not necessary as part of the ritual for these traditional joss sticks to burn down," he said. "By putting them out after a minute or so the air pollution would be cut by 30 to 40 times."